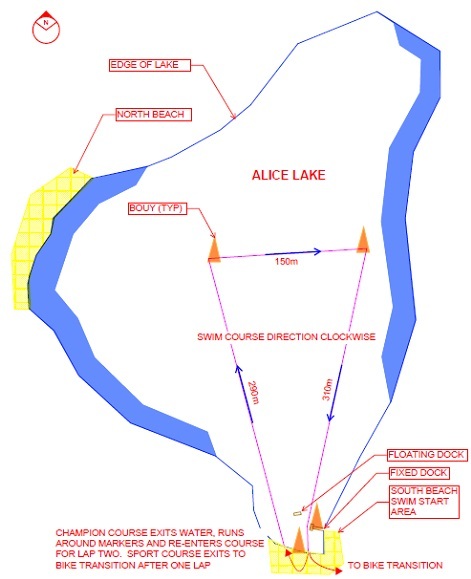 The swim takes place at Alice Lake Provincial Park with the start area and transition located at south beach. Both race distances start and finish at the South Beach. The swim course is an elongated triangle of 750 meters. Sport course competitors swim ONE loop. Championship course competitors complete TWO loops (2 x 750 meters) with a brief exit onto the beach before commencing their second loop. Wet suits are optional. Lake temperature taken on raceday morning by TriBC officials determines whether wetsuits will be allowed. We have strict swim cutoff times: 30 minutes for the Sport distance (750m) and 1 hour for the Championship distance (1500m)! A kayak will lead the first heat of swimmers. Several kayaks and SUPs will be in the water. Lifeguards will be at various points around the lake. A rescue boat is on the lake. If you get into difficulties, roll over on your back and put your arm in the air. Each swimmer must wear the swim cap provided. Weak swimmers have the option of wearing a special coloured cap. Swim cap will be in the race packages. Please ask for a special coloured swim cap at package pickup if you need one.